As a member of the Penn State field hockey team in the late 1980s, Jill Radzinski had Olympic aspirations. Fittingly, her studies in athletic training involved the same goal. 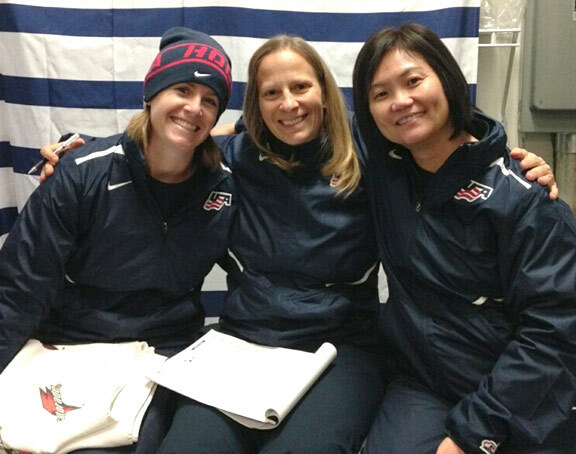 While the former never materialized, Radzinski, who has been a member of the UC Davis training staff since 1997, did reach the Olympics in 2010 – as an athletic trainer for U.S. women’s hockey. It’s a role Radzinski reprises this year at the Sochi Games, where the Americans hope to challenge a Canadian team that has won the past three gold medals. Radzinski began working with the U.S. hockey team in 2008, though she had worked with Americans in short-track speedskating. As the head certified athletic trainer for the hockey team, she treats injuries and oversees players’ rehabilitation while endeavoring with other performance staff , such as strength and conditioning coaches and massage therapists, to keep the athletes in peak shape. Radzinski is as well. She still marvels over the experience of her first Olympics – of walking in the Closing Ceremony, of rubbing shoulders with some of the world’s top athletes in the communal dining facility, of “being a part of something that is much bigger than yourself.” Still, she said, “There are times I reflect on it, and I can’t even remember parts of the Olympics. Radzinski credits the rest of the UC Davis training staff with supporting her balancing the two obligations and said her experience with Team USA has in turn informed her work with college athletes. As for the time commitment – she said the team trained in Boston since September – those Vancouver Games showed the value of the returns.